Weekend Wokking is a delightful event by Wandering Chopsticks in which we celebrate several different ways in which an ingredient can be cooked.Every month a secret ingredient is chosen and foodies world wide can comeup with awesome ways in which you can cook that ingredient. 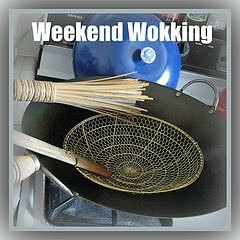 Entries for Weekend Wokking must be written specifically for the event, and the posts cannot be submitted to other food blog events. Exceptions include entries that are also submitted in photo contests. Entries are encouraged to be original recipes created by the submitter, but if you made someone else's recipe, please include a link to that person's recipe. You are allowed to revisit your recipes, provided that the photos and post are new and created specifically for the event. Nice event.Will send in my entry for the event. will try to send an entry for the event, nice theme..
Great event. I'll try to send my entry to this event. Tofu is our favorite. Let me see if I can cook anything for the event.